A 17-year-old man has died following a car crash in Caerphilly county. 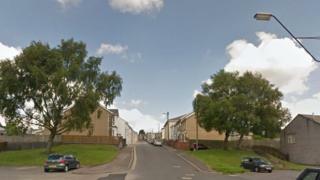 Gwent Police is investigating the collision between a Peugeot 206 and a parked car on Moriah Street in Rhymney at about 03:30 BST on Sunday. Two people were taken to hospital with "serious injuries" and the police has confirmed the driver has died. The passenger is still receiving treatment at Prince Charles Hospital in Merthyr Tydfil. Officers are appealing for witnesses to the incident.